(A) Left femoral neck fracture (thin arrows) and (B) multiple osteolytic lesions in the femur and iliac bone plates (thick arrows) on conventional radiogram. Here we present a case history of a 29-year-old woman who was admitted to the Department of Orthopedics due to severe pain in the left hip occurring after minimal trauma. Surprisingly, radiography demonstrated the presence of a pathological fracture of the left femoral neck. However, this was not the only abnormality visible on the radiograms. Multiple osteolytic lesions of the femur and iliac bone plates with a maximum dimension of 43 mm were observed (Figure 1). A decision for urgent total left hip replacement was made. Both periacetabular and proximal femoral osteolytic lesions were confirmed intraoperatively and filled with allogenous bone grafts. The very young age of the patient, the very low energy of the trauma experienced, and accompanying multiple bone lesions led us to search for an underlying cause. In the differential diagnosis of such a presentation, a metastatic disease with multiple osteolytic bone metastases was first considered.1 A detailed case history revealed that the patient had suffered from a mild pain in the left hip for about 2 years. Additionally, she admitted occasionally experiencing nonspecific abdominal and bone pain, anorexia, constipation, polyuria, and depression. A chest X-ray study demonstrated distortion of a few ribs (rib VIII, IX on the right and rib VI, VII on the left side), also suggesting pathological fractures. An oncological screening was performed, including chest and abdominal cavity computed tomography imaging, but no other lesions suggestive of metastatic changes or potential primary sites were detected. Moreover, serum concentration of measured tumor markers (carcinoembryonic antigen [CEA], alpha fetoprotein [AFP], CA 125, CA 19.9) were within normal ranges. The only abnormality on initially performed laboratory tests was a significantly elevated serum calcium level (15.58 mg/dL, normal range 8.80-10.20). Therefore, a thorough assessment of calcium phosphate balance was performed. The parathormone concentration was markedly elevated (1311 pg/mL, normal range 15-65), accompanied by increased alkaline phosphatase (656 U/I, normal range 35-105) and reduced phosphate level (2.35 mg/dL, normal range 2.7-4.5), suggestive of primary hyperparathyroidism. In addition, the serum 25-OH vitamin D level was abnormally low at 11 ng/mL (normal range 30-80). Her renal function was normal (creatinine 0.8 mg/dL, normal range 0.5-0.9). 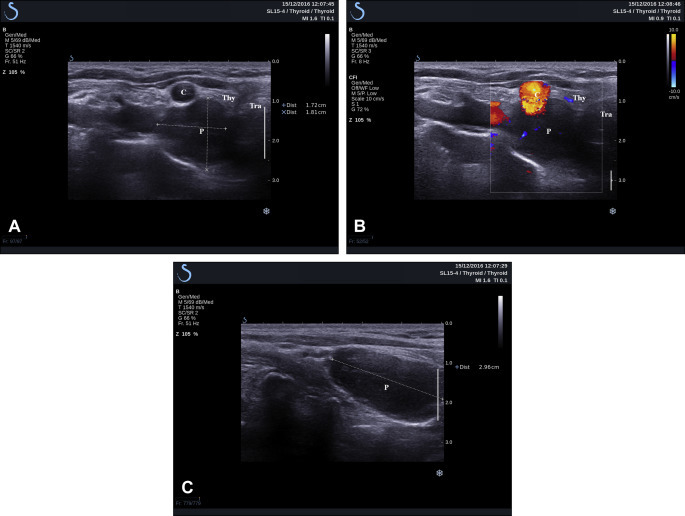 Ultrasonography of the neck confirmed a nodule measuring 18 × 17 × 29 mm of a typical extracapsular location corresponding to the right inferior parathyroid lesion (Figure 2). Using the 99mTc-SestaMIBI scintiscan allowed us to demonstrate a very intense tracer uptake in the lesion, confirming the diagnosis (Figure 3). 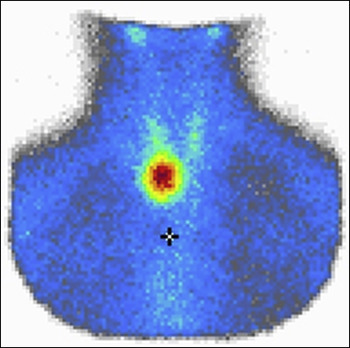 General osteoporosis was diagnosed using dual X-ray densitometry at 2 locations: the radial bone (T-score −5.3), which is an area specifically indicated in primary hyperparathyroidism, and the right femoral neck (T-score −3.3). Osteopenia was also detected in the lumbar spine (T-score −2.1).